Choosing a textile bag, instead of a plastic one is good for Nature and Your health. And wealth. 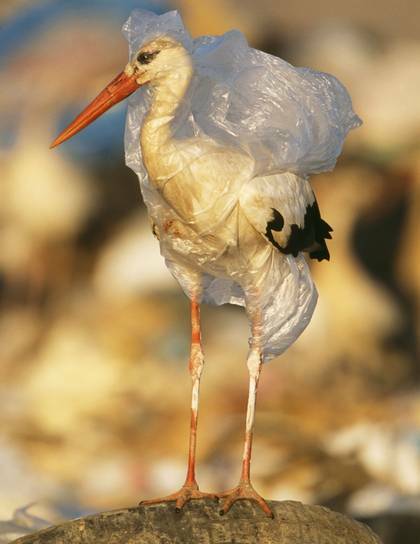 It takes around 400 years to fully break down a plastic bag in nature! Fabricating plastic bags consumes a lot of water, electricity and material. There is six times more plastic particles than plancton in the Pacific Ocean. A huge mountain of rubbish, mainly plastic, is floating around and harming fish and wildlife. Plastic bags in nature can become a deathtrap as shown here. Please take them back home, if You use them! The picture is not mine, found it floating around the webb. Paperbags are not that good eather. They are degradable but processes in making them are not nature friendly. And transporting them takes a lot of lorries. One lorryload of plastic bags is the same amount than seven lorries of paperbags of same size! Growing cotton consumes however also on the natures recourses and factories where cotton fabric is made are dirty. But there is one important way to make a differens! Using things ower and ower again. Reclaiming material and reusing it or remaking it to new things. A textile bag is usable year after year, just wash it, dry it and use it again. I sew my textile bags in fabrics that hawe been other things in there previous life but not been sold, or smaller bits of fabric. Or sometimes cloths in goodlooking fabrics sold at Second hand stores. You can sew Your own textilebag. One way to do is shown here . That is my little sewing school;-). Or, of course, You could byu Your bag from me. My companies, Bomans Nål & Tråd, site is here. A hobby grown to a smaller business. Only in Swedish, so far. Pictures are a good way to show what there is to choose from. Just mail me if You have any questions! Translating it by Google is not a good idea. Only thing You can be sure of is that it will be all wrong. My sister did it, and was laughing when she called me to ask what it was about. She does not speak a lot of swedish. Not much was understandable after the translation.